The High Mobility Multipurpose Wheeled Vehicle (HMMWV) or ‘Humvee’ hadn’t long been in the inventory of the US Military by 1990 and was already a significant improvement over the hodgepodge of commercial pickups and light vehicles employed to fill the gap left by the Jeeps. The opportunity to use this new off-road platform as a dedicated scout vehicle was suggested by 1st Lieutenant Kenneth Deal in the November/December issue of Armor Magazine who pointed out that despite the capabilities of the HMMWV platform, none of the existing variants were suitable. It should be noted that Lt. Deal was at the time a serving officer acting as a Scout Platoon leader for 1-63 Armor. 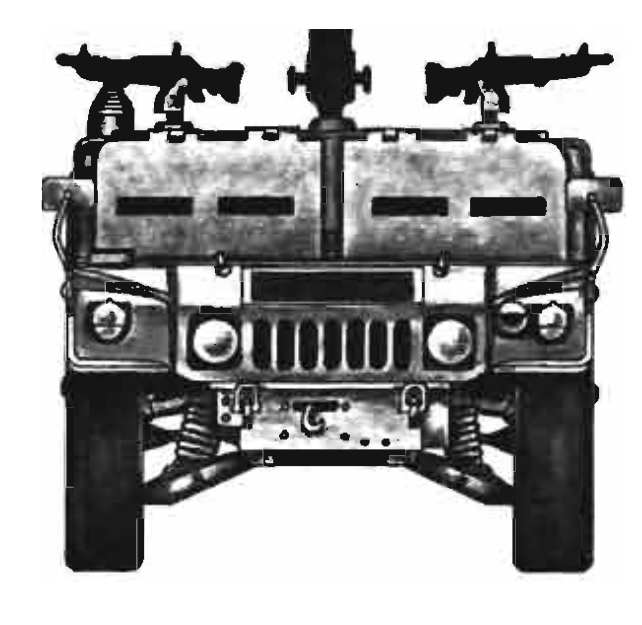 Lt. Deal suggested a new variant of the HMMWV halfway between the M966 hardtop and the M1038 ‘open top’. The M966 was seen as unsuitable primarily because armor was limited to just the Kevlar roof and the small hatch permitted just a single weapon mount. The M1038, on the other hand, could mount a variety of weapons, all of which could be used at the same time, but was unsuitable because of a complete lack of protection. The new variant would have a hard rigid body, making use of Kevlar panels and a hardtop but with a very large rectangular hatch that permitted multiple weapons to be used. The suggestion was to take an existing M1038 vehicle and mount a new body onto it. The windscreens of the vehicle would have to be replaced with two Kevlar shutters, each with two rectangular vision slots and hinged at the top to fold back over the roof when not in use. If a windscreen was kept, Lt. Deal suggested some form of louver could be used instead to reduce the risk of glare from the glass giving away the position of the vehicle. There would be two side doors, one in each side, covered with Kevlar panels and each having a large rectangular window also to have some form of Kevlar shutter although it was not shown or described. Underneath, the chassis would be fitted with skid plates to prevent damage to the powertrain and fuel tank when going off-road, a 5-ton winch on the front and a deep wading snorkel. Personal kit and other stowage would go on the outside of the vehicles with essential tools carried on the rear. Inside, the crew area at the front would be unchanged but the rear would be arranged “much the same as the M113”. The large roof hatch could be closed when not in use and the entire area inside the compartment would measure about 3’ x 5’ (0.9m x 1.5m) providing space for ‘3’ crew consisting of the commander and two scouts. However, as the commander is provided with their own weapon station it seems Lt. Deal either meant a crew of 4, having omitted the driver or intended for one of the crew to act as driver permanently which would obviously mean only 2 of three weapon station could be used at one time. The additional space inside the vehicle was claimed to be suitable and large enough to accommodate specialist teams such as medics or sappers or even a Stinger team. The author noted the general trend away from heavily armored and heavily armed reconnaissance towards light fast vehicle but nonetheless wanted plenty of firepower. An Mk.19 automatic grenade launcher or M2HB .50 cal. (12.7 mm) heavy machine gun, mounted on a swing mount as used on the M1 Abrams MBT, would provide 180 degrees of coverage across the front, fired by the Commander. 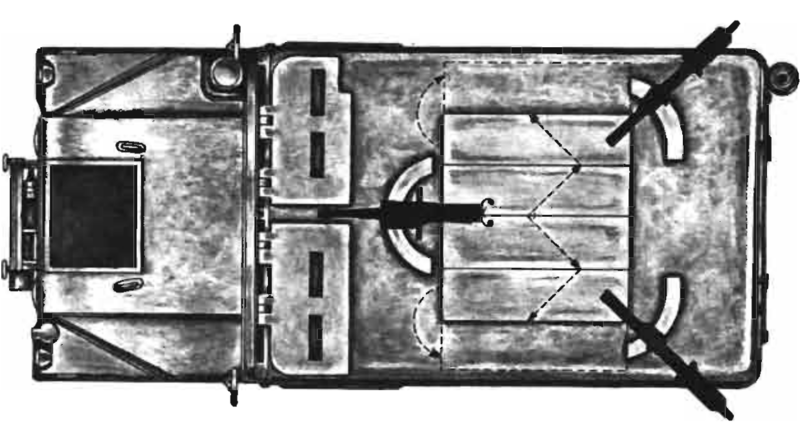 Two M60 7.62mm machine guns would be mounted at the back, with one on each corner also with 180 degrees of arc thereby providing over 360 degrees of coverage between the three weapons. The crew would also have their personal rifles. All weapons were to be dismountable for ground use and all could be fitted with a small shield to protect the crew member when operating it. Finally, smoke grenades would be mounted at the front and rear and a single Dragon anti-tank system should be carried to provide some additional heavy firepower. The author noted that “the use of TOW is actually overkill for the scouts; leave the killing to the tanks”. The vehicle would be fitted with the 1780 AN/VRCI intercom so the crew could all talk without having to use speakers and maintain tactical silence. A land navigation system such as a GPS station along with a laser rangefinder would be used to prevent them from getting lost and providing accurate information on enemy positions. In order to report back, a quick erect AB903 antenna would be used. Some HMMWVs already being used in the role of a scout vehicle for reconnaissance were already fitted with dismounted thermal imagers removed from the M60A3 and the author suggested that this TOW VAS11 system mounted in his concept would provide an excellent all-weather optic for the vehicle and would be mounted in the front right-hand side of the crew compartment. The scout role is a very specialized one. Do you add armor which reduces mobility, do you expect your scouts to fight or just ‘see’? Different countries have different philosophies and a wide range of vehicle have been and still are used for the task. Reconnaissance work is far from simple and no answer is going to be perfect but in 1990, faced with a lack of other options, Lt. Deal (a serving reconnaissance officer) came up with a cheap, simple and effective modification to an existing vehicle which would seem to have fulfilled the role suitably. The ‘armor’ chosen would have barely been bulletproof but would have provided some protection. The firepower envisaged would have allowed plenty of fire to be thrown at the enemy if the vehicle was seen and the entire package was small enough that a single C-130 Hercules transport aircraft would be able to carry three of these vehicles along with the crew. As it happened, none of these Scouts were built to Deal’s plan and, in hindsight, this might have been for the best. In 1987, the RAND Corporation was commissioned to investigate scouting conceptual organizations for the US Military and found that 50% losses for scouts and commensurately poor results from successful recon missions were mainly the result of poor training and a lack of stealth. They envisaged mixed scouting units, motorcycles, HMMWVs and M3 Bradleys instead but as a validation of Deal’s idea they eventually found that HMMWV only platoons for scouting were “the most effective, least costly, and most sustainable organization”. Consequently, the US Army equipped its heavy maneuver battalions with HMMWV-based scout units although this had not been fully implemented by the time of the 1990 Gulf War with scouting being done in the main by the M3 Bradley instead. When they were used, the small size (compared to the M113 and M3 vehicles) avoided unnecessary contact with the enemy but when it did encounter enemy forces “HMMWVs generally did not survive chance encounters with hostile elements” something not the case with the M3 Bradley. Neither solution was suitable therefore and subsequent fighting in Afghanistan and in Iraq showed the vulnerabilities of a scout HMMWV yet further. The poor survivability of the HMMWV apparent after the invasion of Iraq prompted the Armor Center to host a ‘General Officers’ Reconnaissance Integrated Concept Team’ meeting in 2005, where it was found that regardless of armor, the HMMWV was an inadequate scout vehicle, even in its heavily uparmored M1114 form. Work conducted at the National Training Center prior to and subsequent to Lt. Deal’s 1990 concept showed that adding more armament to the scout was also a bad idea. More armament meant engagements were more likely and during simulations “too often, scout platoons became engaged in combat and were destroyed”. Either the scout is small enough to avoid contact or it is well protected and armed enough to survive contact. The HMMWV was neither. This point is summed up well in 1991 by 1LT. Gameros who said in comparison to the M3 and HMMWV that “the M3 is not as vulnerable to enemy fire, the Bradley can serve as a fighting screen, the HMMWV cannot…[while] .. the M966 [HMMWV] is a better enemy finder.. the M3 is a better enemy fighter”. The HMMWV then would have made a decent scout, small, mobile, and easily deployable up to the point of contact. When the shooting starts the HMMWV consistently showed itself to be a poor choice for survivability. Adding significant firepower and armor to the HMMWV then for scout use ironically makes it less survivable, just too vulnerable. The US military is currently left with Scout HMMWVs and M3 Bradleys still for its scouting role and has not yet found an adequate halfway house between the two for the role. Lt. Deal’s idea was one of many at the time to make use of the mobility of the HMMWV but sadly owed more to WW2 era thinking, best suited to wide open deserts than to a modern war or counter-insurgency operation often in complex urban environments.